In some cases, diagnostic imaging may be ordered to assist the doctor in arriving at a concise diagnosis. All imaging is done at an imaging center outside of this office. The patient has suffered some type of trauma. The patient has been in a motor vehicle accident. There is a need to rule out some type of pathological process such as fracture, infection, severe degeneration, or osteoporosis. Discs, nerves, muscles, tendons, ligaments, and fascia are all soft tissues that do not show up on X-rays. These soft tissues are the cause of the majority of cases of back pain, but injuries and restrictions in these structures do not show up on X-rays. 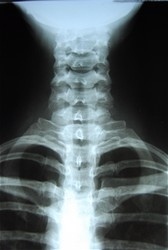 The bottom line is that most routine X-rays of the spine provide little diagnostic value. The spinal abnormalities detected with X-rays often are variations of normal wear and have nothing to do with the symptoms that the patient is experiencing. It is the information gathered during the physical examination and history that shape the treatment plan. MRI (Magnetic Resonance Imaging) uses radio waves and a strong magnetic field to provide clear and detailed pictures of internal organs and tissues. The MRI shows nerves, muscles, tendons, ligaments, and discs, as well as the bones of the body. Under the right circumstances, MRI is a good diagnostic tool which can provide detailed information about the condition of the soft tissues. However, in most cases, MRIs are neither needed nor justified. Again, as with x-rays, an abnormal finding on an MRI may be nothing more than an indication of the normal degenerative changes that occur due to aging. Many of these so-called abnormal findings are commonly found in people who have absolutely no back pain. An MRI will give you a better picture, not necessarily a better diagnosis. For example, an MRI may show where a disc is protruding, but will not show the cause of the disc protrusion. All MRI findings must be correlated with the symptom patterns and with the results of the physical examination. It is only when these readings correlate that the practitioner can be assured that his diagnosis correctly reflects the true problem. The American College of Radiology (ACR) guidelines suggest MRI for people with possible spinal cord injury and clinical concern of cord compression, in those suspected of having ligamentous instability or suspected arterial injury. Guidelines on MRI for low back pain is somewhat ambiguous. Fortunately, sufficient research exists to help guide the need for advanced imaging. As a general rule, scientific evidence advises against imaging patients with nonspecific low back pain within the first six weeks unless severe or progressive neurologic symptoms are present, or serious underlying conditions are suspected. In fact, imaging (X-ray, MRI or CT scan) for low back pain without indications of serious underlying conditions does not improve patient results in the short term (less than three months) or long term (six months to a year). Therefore, the literature recommends that doctors refrain from routine, immediate imaging in patients with acute or subacute low back pain, unless they suspect a more serious underlying condition. The results are similar for neck pain. In the absence of serious injury, a good clinical examination is better at ruling out structural lesions causing neurological symptoms. Nevertheless, people worry when they experience new symptoms or their pain continues for a long period of time. This worry reinforces their desire for advanced imaging, as they believe it will help address their symptoms. This idea can ring true in many things, but not in the case of back and neck pain. American College of Radiology spine trauma imaging guidelines . National Guidelines Clearinghouse, 2008. Samson, K. “Low Back Pain MRI’s, Surgery Rates Higher in Areas With More Units.” Neurology Today , Nov. 9, 2009. Nordin M., Carragee EJ, Hogg-Johnson S, et al. Assessment of the neck pain and its associated disorders: results of the Bone and Joint Decade 2000-2010 Task Force on Neck Pain and Its Associated Disorders, Spine, 2008 Feb 15;33 (4 Suppl):S101-22. Chou R, et al Surgery for low back pain: A Review of the Evidence for an American Pain Society Clinical Practice Guideline. Spine, 2009 May 1; 34(10):1094-109. Chou R, et al. Imaging Strategies for Low Back Pain: Systematic Review and Meta-Analysis. Lancet, 2009 Feb 7;373(9662):463-72. Chou R, et al. Diagnosis and Treatment of Low Back Pain: A Joint Clinical Practice Guideline from the American College of Physicians and the American Pain Society. Ann Inter Med, 2007 Oct 2;147(7)”478-91.